It seems to me that the limited social networking opportunities available to most youngsters in the 1950s compare very unfavourably with the present situation. To be fair we did have the church youth club and its table tennis and soft drink facility, not to mention the opportunity to talk to that strange species called ‘girls’. Youth club girls were non threatening and gentle as they gazed at the little white ball that pinged and ponged. Furthermore a certain kind of boy, together with mates of the same ilk, would chase a leather ball up and down the Bracken Court pitch and pretend to be Len Shackleton or Jackie Milburn. Me? I was tough tackling Glynn Davies, a then notable Derby defender.We might also have played snooker in Durham City and I believe Alan Burn enjoyed doing that. Men had it better: dogs, pigeons and working club pints were some of their well established hobbies, but we had not yet crossed the line into family responsibility and taken the too often stultifying jobs, many of which were dangerous if you lived in a mining community. In 2011 there is the expectation of being in secondary education until the age of 18, or its equivalent, and quite often that is extended into ‘Uni’; it brings huge opportunities for social interaction and friendship with fellow students. Texting, Facebook and twittering give the opportunity to cement that freshly created network of friends and it can enable youngsters [if not seriously sidetracked] to work through the complexities that often accompany adolescence. The prize at the end of the process was, and still is, a mature outlook, true friends and an all round personality that can lead to greater things – if the desire is there. But many of us – of 50s vintage – got through despite the ridiculous educational system that labelled 75% of us as factory fodder. We were able to laugh, twist like we did last summer, snog, pick blackberries for pie and enjoy Pepsi Cola accompanied by Cliff Richard or Elvis. I was a Cliff man but I reckon Neil Davies was right to plump for Elvis. Memories Outweighing Our Dreams? Never! I don’t always know the nature of my article until the very last moment; this one might have been entitled ‘accelerating towards birth’ and very nearly was. After all my mum frequently said to me ‘you almost drowned during childbirth’ . I have been perplexed about that for a long time; was I born during an initially tranquil walk alongside a canal that almost went badly wrong, with mum staggering and stumbling to the canal edge? Or did the birth occur during an exhilarating water slide journey? Occasionally a WB article is a vehicle for rant, rather than memories, but thankfully the cluff police [ that’s my name for them] are usually on hand to stop it at an early stage and thereby save me from appearing to be a complete arse. Tonight let good old Bill Clinton, from the USA, be my inspiration. ‘When our memories outweigh our dreams, we have grown old’ stated Mr Clinton. Well I think he is right. My memories of Ushaw Moor and Sleetburn are almost all good ones, although I recall the gob into my face; I dwell on the good ones to excess but I estimate that the last two years worth have been mainly motivated by the need to help Paul keep this site up and moving. My memories on this site, that relate to 1950 – 1960, are about the child; they were often personally exciting events and helped form this adult. But this adult is now fully grown, like a tall tree in the forest. Except when I’m bent over with bad posture. My dreams are those of a man rather than a child; they are important to me and they bear down at every hint of procrastination. A dream. I really must explore the idea of visiting residential homes for the elderly, and nursing homes, with a view to reading good literature to residents and discussing it with them. I will no doubt learn much from it. If a creative writing colleague can agree to join in that would be great. I must explore this idea next week and act upon it, if the interest is there. I will never turn down any offer of a cup of tea and I ‘ll supply the petrol needed to get me there, if fuel prices slow down a bit. A dream. To take history as far as I can academically.I recall fellow student Brenda Wilson of 1968 vintage; we studied the Normans but now I have my sights on the Reformation, so wish me luck. A dream.To be the best cook in our extended family. A tough one. Resting on my porridge credentials simply will not do. A family of that name took some brilliant pictures of Ushaw Moor and London during the year 1935. 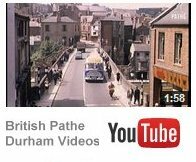 Some additional pictures are notated ‘Durham’ but I am quite confident that some of them are also of Ushaw Moor. Family forenames such as Ken, Gladys, Matt and Bill are there to see. Also picasweb.google.com/ might be another way to get to them. Paul might be able to put the pictures on site [subject to copyright considerations] or at least provide the link. That statement was uttered last week by one of my Nordic walking colleagues during one of our group’s very active sessions up on the local army ranges.The Facebook and Twitter versions of this article have the word ‘escalating’ rather than accelerating but accelerating is the amended and accurate quoting. Anyway the statement came during a ‘putting the world to rights’ session and although it caused a pause for thought by those that heard it, it did not worry me a great deal; neither did I miss a stride as we began to climb a gentle hill, because I thought it best to seize the moment and seize that hill! If somewhat ageing people have retained good health, played their cards right, had a fair measure of luck, and have a penny in their pocket, they may well be able to exploit their life experience and maturity whatever the amount of time they have remaining. Whether they have decades ahead or not every morning may well be a joy to savour and every encounter a wonder to behold; each afternoon may be spent recovering but that is another matter, another load. Even though it is understandable and pleasurable to look back and then fill this site with fond reminisce, we must live in the real world – the present- and try and fill it with a sense of purpose, otherwise we may well be living an unconsidered life. Your sense of purpose may not be the same as mine but that might be just as well. My fond memories vary from week to week. This week they are all about buying liquorice root and Everton mints from the corner shop in Rock Terrace, Sleetburn; primary school colours in the form of deep filled apple and orange drawings on the board, made by trainee teachers with squeaking chalk; and not forgetting silver stars in my exercise book that confirmed effort and brought personal pride and purpose. Next week it might be about the red shirt and white shorts that were handed to me by sports master Harry Barlow, for the very first time, and which led me to walk on air down to the Empire before I wheeled to the left and [eventually] joyfully turned to the right into Whitehouse Court. ‘Mam, I’ve been picked for the school football team’. Are Your Eyes Hands And Brain Still On Song? My wife has just this minute thrown to me my newly washed face towel; it involved projecting it twelve feet up the stairs at quite a pace yet I caught it right handed, despite being essentially left handed. How about that? She is forever throwing things at me but let’s move on. Back in 1959, during a game of rounders on a day full of sunshine, I ran down the hilly bank at Ushaw Moor school [with Mr Foster’s woodwork room away in the far right corner] and then dashed ten yards before finally diving to take a catch. It was a brilliant catch – one of my best – but to this day I am not sure that catching that ball was the point of the game. The Club Has Gone: What Are Your Memories Of It? If the startling space in Station Road took some getting used to what about the greenery that greets you in Sleetburn’s Unthank Terrace? It is clear that the disappearance of the two clubs located in those areas diminishes and dims the culture and memory of local working men’s clubs. All is not entirely lost: there is the New Brancepeth club at the top of Unthank Terrace, as well as the Catholic Club in Ushaw Moor, both of which serve the present social needs of some villagers; the latter with an added religious dimension. So what has been lost apart from remnants? I can only recall one visit to Ushaw Moor working men’s club; it was in the company of my fellow Ushaw Moor County full back, the late Tommy Wilkinson, in the spring of 2002. It was a reunion after 42 years and I found him pleasant and reflective as we drank our pints and chatted. We had sat in the bar and by doing so doubled the number of customers in the room.I am aware that a few years ago there was a tragic fatality outside the working men’s club in Ushaw Moor, but I will put that to one side. It was all a far cry from the glory of yester-year when beer would have flown and crack about pit outputs and pigeons very likely danced off the walls. My observations about the clubs are largely from primary sources. Brian M recalls the miners that bought pints for the tired and grateful German prisoners of war that had been spotted walking up Unthank Terrace. Norman Hope recalls the Ushaw Moor cricketer that was too often drinking in the Ushaw Moor club when it was his turn to bat; Dickie Hope, the somewhat alarmed captain, often had to send someone to the club with an urgent message to ‘get yourself down to the club house you daft bu…. it’s your turn to bat’ That same drinking player wore a red ribbon that served as a belt. So what caused the demise of many working men’s clubs? There are some rather obvious causes: the closing of coal mines, drink and drive limits, smoking bans, cheap supermarket booze, and the indifference of modern youth. Can you think of others? Back in the 60s some Northern clubs were ambitious and the Greasborough Club, near Rotherham, is one of the best examples of that. It was built in the early sixties and in its prime had long queues waiting to get in. Top stars performed there such as Johnny Ray, Bob Monkhouse, Elkie Brooks, Jayne Mansfield and The Seekers; sometimes on the same bill! But by 1969 it had gone, partly I suppose for the reasons given earlier. So what are your memories of the clubs that have gone? Was the beer cheap at Christmas and Easter? Did the club run trips and if so was the Crook Town v Derby County cup-tie of 1955 one of those trips? Redcar? Roker Park? St. James Park?